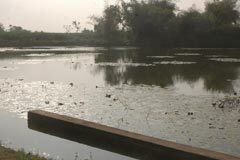 +91- 435 - 2000 503. 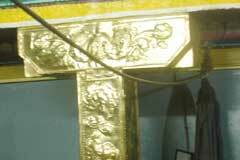 Tirumangai Azhwar exhausted all the money he had in the renovation of Srirangam temple. He had nothing left to pay the wages for the workers. He prayed to Lord for money. 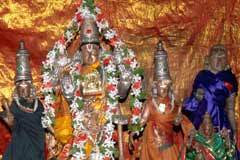 Lord, in a voice, pointed out a spot on the banks of Kollidam and asked Azhwar to come there to collect the money. Azhwar found a trader there wearing a turban holding a measuring bowl (marakkal), palm and Ezhuthani. 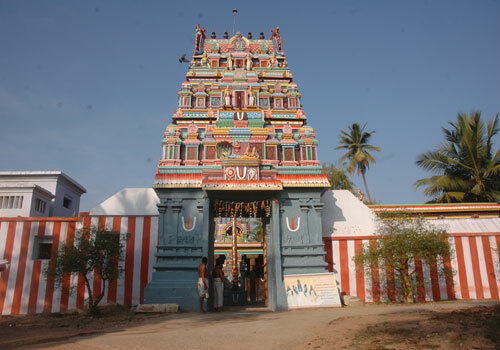 The trader told Azhwar that Lord Ranganatha had sent him to help Azhwar and asked him his need. 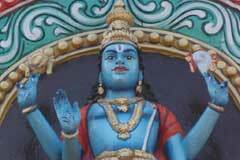 Tirumangai required money from him to pay wages for the workers. The trader said that he had no money but the Marakkal he had would fulfill the need. He said that he would give sand measuring by his bowl, which will turn into gold only to such workers who sincerely worked and would remain sand itself to those insincere. Azhwar accepted the condition. To many, it was sand only. The workers felt that the trader was a magician and began to attack him. He began to run away. Azhwar too chased him. The trader stopped at this place. Azhwar asked him who he was. The trader-Lord appeared in His true form. 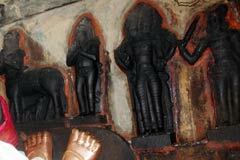 He taught Azhwar in writing on the palm with the Ezhuthani. 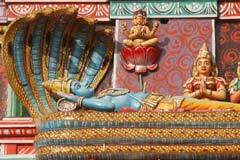 Lord Perumal appears in His reclining form with His consorts Sridevi and Bhoodevi. 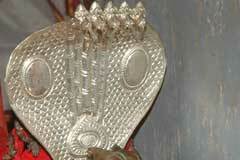 He has His Marakal-measuring bowl- as the pillow holding the palm and ezhuthani in His left hand. 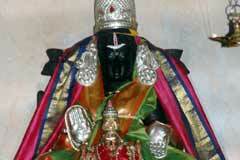 Lord is resting in this form after looking into the needs of His devotees, it is said. 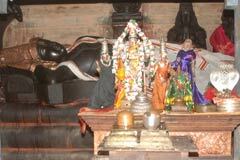 Divine cow Kamadenu is at the feet of the Lord.